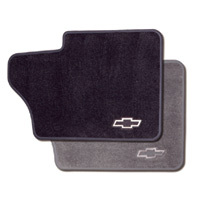 Keep your Chevy Silverado looking like new with these premium floor mats. Custom-designed for the Silverado, the fit is ideal and the carpet is color matched. These durable mats will protect the floor of your Silverado from elements like mud, water or road salt. Front mats feature the Chevy Bowtie logo.